These are some of the many questions I have been asked by Greeks, especially over the past few weeks, related to their economic crisis and the potential for self-organization and survival. My first visit to Greece was after a network of assemblies translated into Greek?Horizontalism: Voices of Popular Power in Argentina, an oral history I compiled on the popular rebellions and forms of organization that emerged in Argentina after the 2001 crisis. I have continued to visit over the years, the last occasion in the days leading up to the referendumwhere the Greeks voted a resounding “No” to austerity and the coercion of the EU. In this article I focus on the Argentine barter networks, both because it is a specific question that is raised repeatedly in Greece, and also because there are some very concrete forms of organization and lessons that can be derived from the experience. It is also because there are already many different forms of barter throughout Greece, from local villages trading based in history and custom, within families and family to family to an increasingly large number of activist and community organized spaces of exchange. Within this culture of barter, immediate questions are arising as to how the networks can be expanded, if they are the right base for a currency based network, and what sort of support to ask for from the government to help ensure their existence. The estimates vary, but somewhere between four and seven million people participated in the barter networks in the first years after the economic crisis in Argentina. For countless people it meant the difference between surviving or not, eating nutritionally or not, having basic necessities, or not. While the networks took off with massive numbers after the 2001 economic collapse, there is a long history of the barter of goods for goods in Argentina, just as there is in most parts of the world. Before the economic crisis a few urban ecologists began experimenting with the use of a cupon as a representation of value in exchange so that people who did not have access to money could still access things they needed. 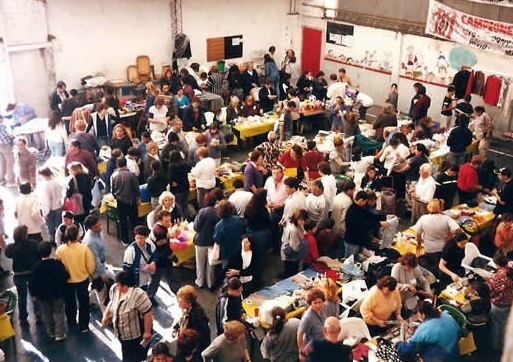 Their experiment in Quilmes, a neighborhood outside Buenos Aires, had already taken off before 2001, and after the economic collapse was used as a model for the exchange of goods and services. The way it worked was that a location was used to house the barter itself (called the?clubes de trueque?or barter club) and people would join the network in that location (called a?nodo?for?no dinero?– no money). Each person who joined would first have to go to a few orientation meetings and was encouraged to think about what they could bring to the barter in the form of exchange – one of the rules for participation. The idea was that each person is both a producer and consumer – (called?prosumidores?– prosumers). Each?nodo?was autonomous and created their own rules, such as how many of the?creditos(credits) – representation of value in the exchange – a person would receive when they began participating. All had the same rule that the official currency of the peso was prohibited. The actual trading would take place for anywhere from an hour to many hours one or a few times a week and were located in a range of places, from community centers and parks to recuperated workplaces. 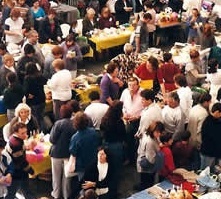 In the beginning of 2002, there were over 5000 barter clubs with many thousands of people participating in each?nodoregularly. Then, with millions of people actively involved the barter economy collapsed. At approximately the same time that the three initiators of it were arrested by the government and charged with a long list of charges related to the illegal creation and exchange of currency, millions and millions of?creditos?flooded the barter market, causing a hyperinflation. The?creditos economy collapsed. The fear that there would be many more arrests and collapse of the barter economy simultaneously caused people to turn to other ways of surviving and bartering, without the representation of value. There was a subsequent massive decline in barter. There has been a rise again in the barter networks in Argentina since 2009, but still nothing on the scale of the post 2001 crisis. On to the question that so many Greeks are asking, what might they learn from the Argentine experience. Perhaps one of the first things is to get the government of SYRIZA to agree to not criminalize the participation in barter networks, whatever sort of value for exchange is developed. It could be in the form of a law, or written agreement, however the agreement it made, that is happens seems paramount. Second is to learn from the mass counterfeiting of the?creditos. While it is a common and popular opinion that it was the government that sabotaged the barter network in Argentina, there is nothing to prevent another nefarious group from doing the same. So how to prevent it? One suggestion has been to change the currency regularly. Another is to have one that has ink that physically disappears over time, thus making accumulation impossible. I am sure, knowing the challenges the Argentines faced, that the Greeks can come up with a creative solution. Most important is that millions of people in Argentina survived by exchanging what they already had, could do or could make. While Greece is an island geographically, it is not politically. Movements and groups from around the world are anxious to support the ongoing and expanding efforts of people organizing from below to survive. And not only to survive – but the possibility is there to recreate and reorganize society from below. Barter with a value in the exchange is just one of the many tools possible in this process. Perhaps Greece can not only show the way with alternative means of exchange within Greece, but initiate a global network of exchange outside the formal capitalist economy. As the Argentines learned, crisis is an incubator of inventions. 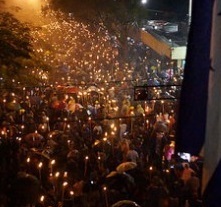 Movements around the globe are anxious to support the Greek movements however we can.